This is your day! Grab your friends to make it an afternoon of relaxing with Mimosas and painting at Carlos Creek Winery! You will get to paint during the 'Sparkling Sundays' event so your admission ticket also includes an unlimited buffet of donuts, muffins, fresh fruit, and mimosas!! We will be creating our 'Love Birds in the Snow' Painting! All supplies are provided including your 11 x 14 inch canvas. 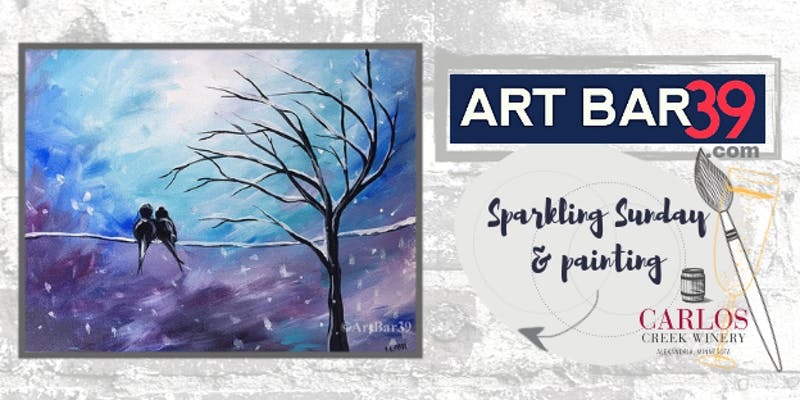 This painting is an adorable winter piece that its easy for anyone to learn - especially if you have never painted before! Art Bar 39 Artists walk you through each step of the painting. You get to get cozy, chill and CREATE something you will LOVE! Painting starts at 12:30pm and wraps up around 2:30pm. Please feel free to arrive earlier to grab your mimosas etc. You must have your ticket either on your phone or printed so the winery staff knows you have paid. email artbar39info@gmail.com if you have any questions or need help registering for this event.